In 2019 tiles will look like anything but tiles…unless they look exactly like tiles! Confused by that prediction? With the advancements in inkjet technology, you needn’t be. Digital printing of ceramic and porcelain tiles allows these floor and wall workhorses to take on any color, any finish, any pattern your decorating heart desires. Beauty and functionality combine in a form impervious to water, making bathroom and backsplash applications practically limitless. Underfoot, the endurance of high quality flooring tiles make them a popular choice for high traffic areas. 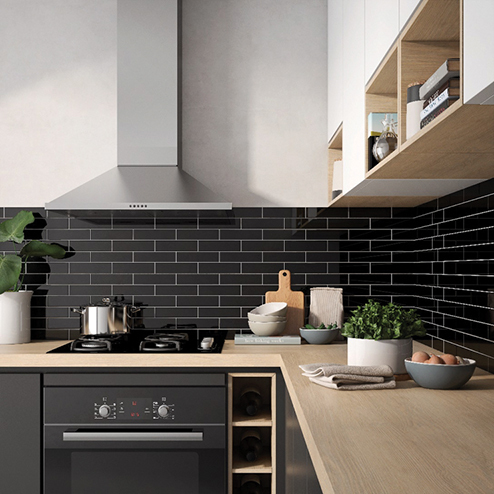 As you explore the tile trends for 2019, keep in mind that matte finishes are easier to maintain than gloss. Also, remember to check the PEI rating of the tile you are considering which indicates the hardness and durability of the tile, ensuring that you use the right types of tile in the right locations. For example, wall tile should not be used on floors. And although you can use floor tile on walls, you should consult with a professional regarding the weight of the tile combined with the weight of the adhesive and grout which might be too much for your walls to handle. With those cautions in mind, let’s look at five of the top tile trends for 2019. Wood-look tile is returning as the #1 trend in tile for the second year in a row. With thinner grout lines and a forgiving, dirt-hiding grain line, wood-look porcelain tiles are easy to clean. Whites, light grays and cool tones are the most popular shades at the moment. Because porcelain tiles start with a white base, it’s easier to get a true gray or white-washed look than you would get with real hardwood. As a solid hue, or as part of a pattern, colored tiles enliven your rooms. Thanks to the aforementioned inkjet digital printing, large slabs of porcelain can be printed in any Pantone® color. The company revolutionized the printing industry with its Pantone® Matching System (PMS) in 1963. The system organizes color standards through a proprietary numbering system and chip format. The color language supports all color conscious industries across multiple materials. Your tile could be perfectly matched to your paint, or to a color featured in your drapery material or wall coverings. The blues of 2018 remain popular, but green takes the lead in 2019. Try pairing green tones with natural elements like stone and wood (think sinks, benches, countertops) to create mindful balance and positive energy. Or step into the future with “Neo Mint,” a pastel shade of green that London-based trend forecaster WGSN predicts will influence fashion and interiors into 2020. Following the renewed focus on artisanship and craftsmanship, magnificent tile patterns will emerge in 2019. 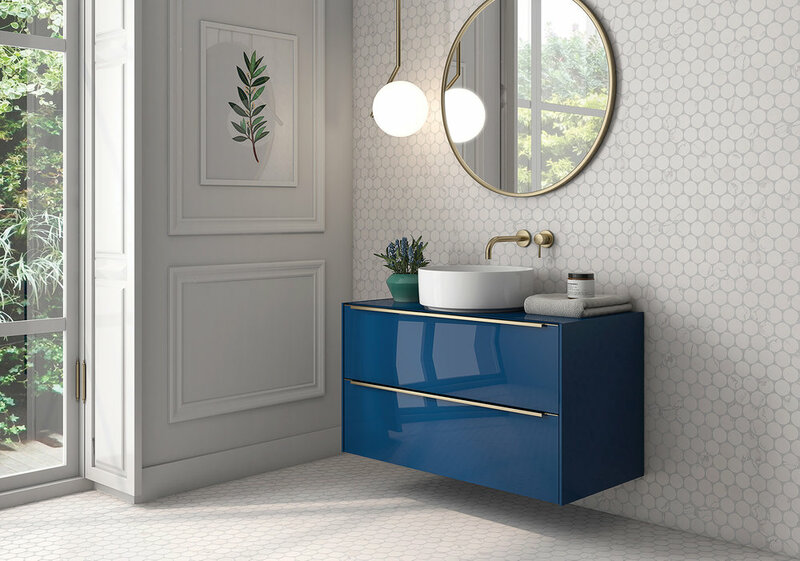 Bold geometrics, inspired by the Art Deco movement, and intricate bohemian patterns dominated the showroom floor recently at the annual CERSAIE International Exhibition of Ceramic Tile and Bathroom Furnishings in Bologna, Italy. Printed patterns can be applied to porcelain slabs as large as 5.25-by-10-feet, combining the creative effect of wallpaper with the technical benefits of ceramic. Printed tiles are not the only way to introduce pattern to your project in 2019. Using tiles to create patterns in the age-old mosaic method adds another dimension to floor and wall spaces, especially if those tiles are multi-dimensional, an effect obtained by applying layers of finish. The classic herringbone pattern is a timeless trend, appearing in 200-year-old homes as well as brand-new ones. But don’t confuse it with a chevron pattern, which was popular a few years ago. Both are zigzags, but in a chevron pattern the pieces meet in a “V,” whereas in a herringbone pattern the pieces are staggered and actually resemble a broken zigzag. It is a subtle, but important, design difference. Versatile hexagon-shaped tiles, from the diminutive “penny tiles” trimming a bathroom wainscot to larger hexagon tiles found on floors or climbing the walls, can give an older home an updated look or be installed in a new home to create a vintage feel. A perusal of Pinterest or Houzz will turn up a plethora of black and white tile projects. From modern farmhouse kitchens to retro bathrooms harboring honeycomb floors, black and white tile combos fit almost any décor. Used in a geometric pattern, the two-color tableau can be mesmerizing. Expect to see plenty of checkerboard floors, that staple of kitchens past. Another application of the classic combination is a dramatic interpretation—solid black tile floors contrasting sharply with white tile walls. Clearly, tile has moved away from boring beige! But before you cover your bathroom walls with magenta hexagons or create an intricate, colorful, Moroccan mosaic on your country kitchen backsplash, give consideration to resale value. Most real estate agents will tell you that bathrooms and kitchens can sell houses. Likewise, a poorly tiled bathroom or kitchen could negatively affect the salability of your home. Consulting with a tile professional or allowing them to complete your project can save you from a costly mistake. KC Marble & Tile has proudly served Southwest Florida for over 10 years. Family owned and operated, our experience and knowledge keeps our clients coming back. We are a full-service company that will help you from beginning to end. Visit us today to experience the best in personalized home upgrades and the highest quality products.